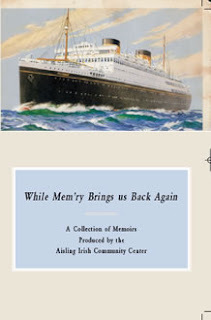 “While Mem’ry Brings Us Back Again” is a volume of memoirs by Irish emigrants who moved to the U.S. between 1927-1964. Compiled by Frances Browner, organizer of the Aisling Center’s “Young at Heart�? group, the book details the experiences of 35 different individuals from 18 different counties. Browner says of the emigrants’ recollections: “I was transported back 50 years and plunged into a place that was already forgotten by the time of my own arrival in 1987. Why did I not know all this before? Putting this book together may help keep these memories alive for future generations of Irish Americans to know what it was like to be a new arrival.�? New York’s Daily News carries a report on last week’s launch, in which it profiles Frank Bergin, an 82-year-old who moved to NY just before the 1929 stock market crash. He recounts being shot in Alsace in 1945 while fighting in World War II; he went on to become the president of the Irish Business Organisation of New York and still works selling real estate. Order the book at the Aisling Center website.